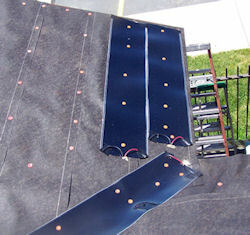 The RoofHeat STEP roof deicing system uses an exclusive polymer blend that heats when electricity passes through it. This thin, flexible heating element has the ability to self-regulate its electrical consumption, making it energy-efficient. Because of its ability to accept AC or DC current, solar and wind power can also be directly integrated to the system.